Mirador is a software tool aimed at the visual exploration of complex datasets, with the ultimate goal of finding potential trends or correlations which can then be tested rigorously with more specialized statistical tools, and lead to new hypotheses. 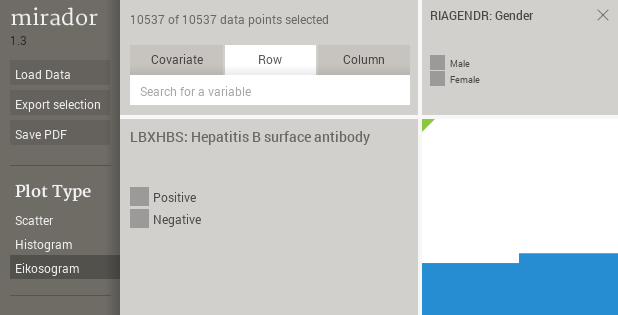 Although Mirador accepts any type of data as long as it is formatted correctly in a standard table format, it is specifically tailored to healthcare, epidemiological and infectious disease data. The options panel is the location from where the user can load a dataset, export selected data, upload findings, and grab a screen capture of the entire Mirador window in pdf format. 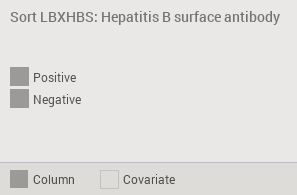 The options panel also contains some additional parameters (P-value and available data %). The search bar lets the user lookup variables by name, which is useful in large datasets where manual browsing can be difficult. 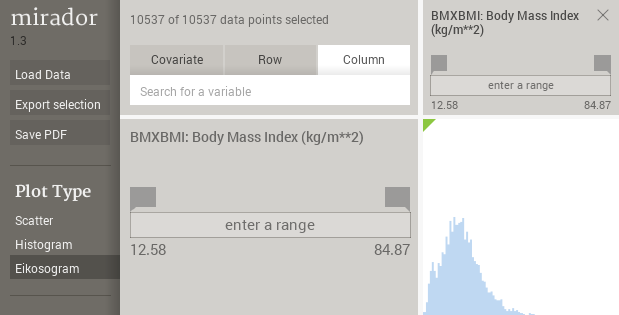 It also displays the number of selected data points under the current variable ranges. Upon start up, Mirador will open a file selection window to allow the user to select a file for upload. To open a new dataset, you can use Load Data button in the options panel, which will bring another file selection window. This page details the file formats supported by Mirador. The user can scroll up and down through the list of groups, tables and variables simply by dragging the mouse on the screen. Clicking on any open element group or table will advance the user forward. However, this hierarchical arrangement of variables is optional, and loading a dataset from a stand-alone table will result in all the variables being displayed in the first level of the scroll list. 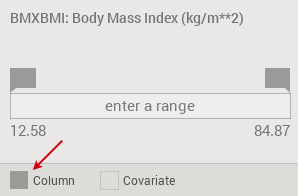 The search box in the top bar allows search variables along the rows or the columns, as well as open covariates (more about covariates in section 4.5). Variables in a dataset can have two names: a short, abbreviated name, and a long, descriptive name. 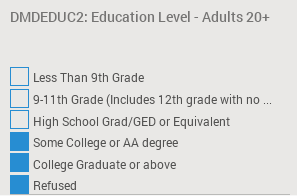 For example: AGE and “Age at admission” could be the short and long names for a given variable. The search functionality will look for matches between the string typed in the box with the short or long names. The matching variable names will be displayed in a list that the user can select. This list can also be navigated with the UP and DOWN arrow keys, and the RETURN/ENTER to select. After selecting an entry from the result list, Mirador will jump to either the column or row that corresponds to the selection, depending on which search tab (covariate, row, or column) is currently highlighted. If the covariate tab is highlighted, Mirador will open the covariate box for the selected variable at the bottom of the browser. Pressing the SHIFT key while clicking on a checkbox will result in inverting the current category selection. 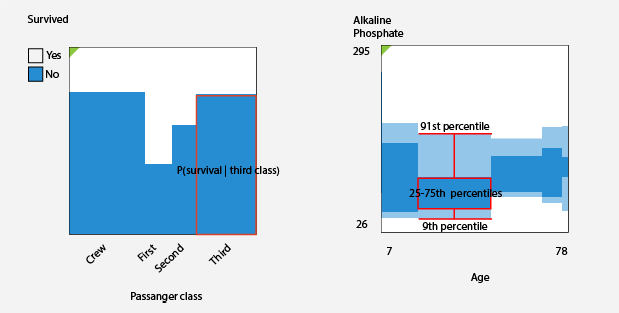 This behavior can be useful to quickly switch and compare between two categories, or one category can be compared to all the rest. 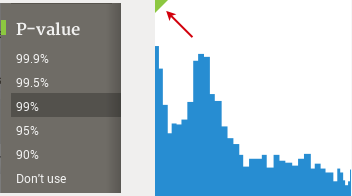 The information bar at the top of the window will update the number of selected data points. A “Reset” button also appears next to the counts. Note that several ranges can be specified simultaneously. 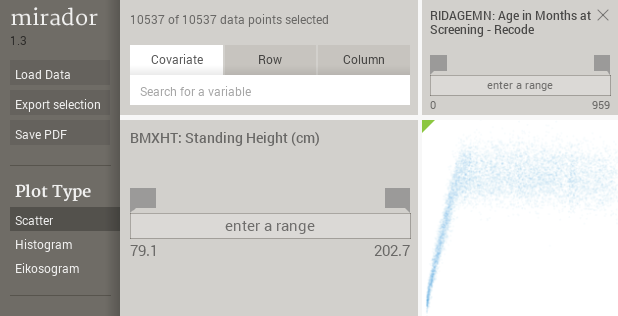 This results in Mirador using for visualization and calculation only the data points that fulfill all the range conditions at once. By default, the columns are arranged following the same order as the rows, which reflect the original ordering of the input data. However, one might be interested to know, given one variable, which variables have the strongest statistical association with it. 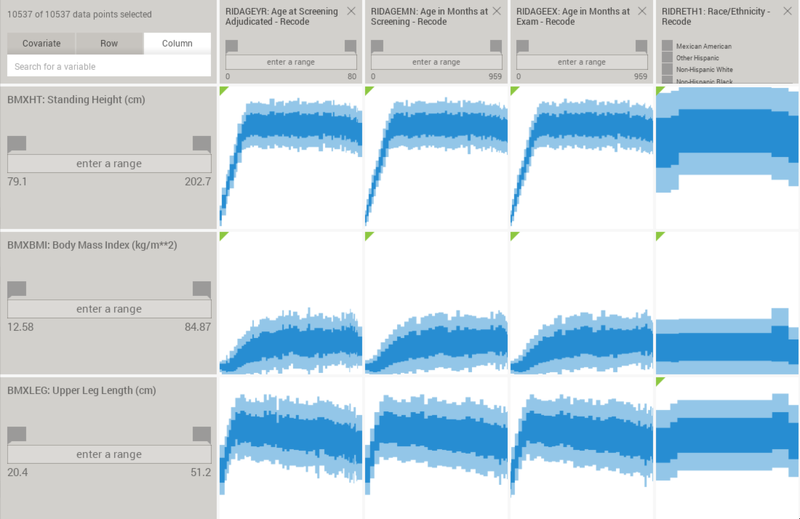 Although it is possible to visually inspect each plot and scroll through the columns until the user finds the plots that show possible strong associations, this process would be only possible with datasets with a small number of variables. The sort operation can take up to several minutes if the dataset is very large, but it can be cancelled at anytime by simply clicking on the title again. 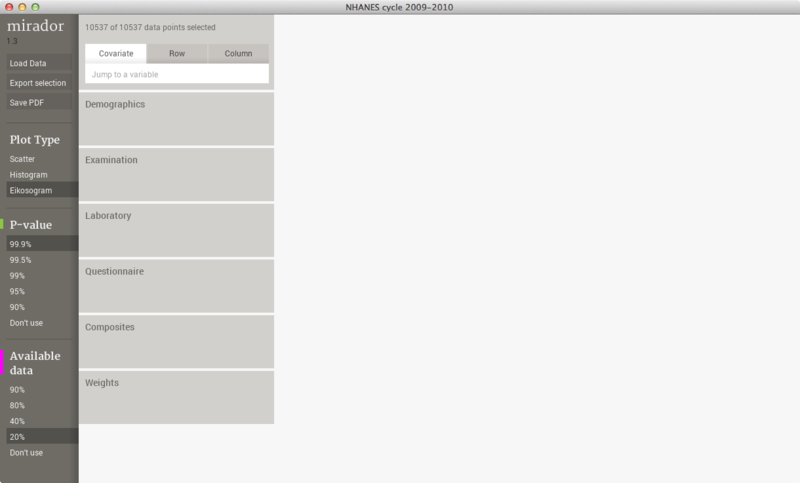 The rest of the UI can still be used normally while the sorting calculation is carried out in the background. Once the sorting is completed, the columns will be arranged from maximum to minimum scores. 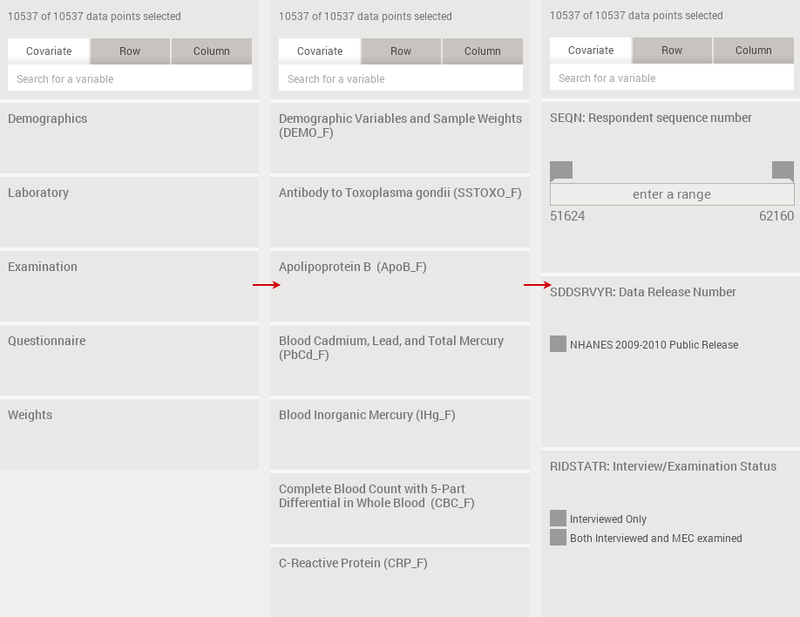 As a consequence, scrolling the columns to the right will show variables with progressively weaker associations. To return to the original ordering, one can click the variable name again. 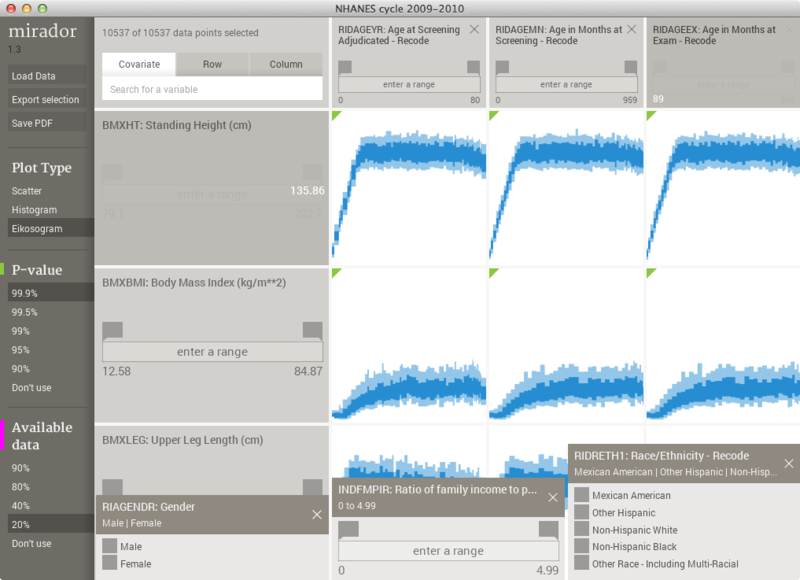 Mirador displays the data for each pair of variables using three different plot types: scatter, histogram, and eikosogram. The scatter plot is the most straightforward representation of the data. For numerical, continuous variables, each circle simply stands for a single data instance. However, in the case of categorical variables, the position of the circles is randomized by wiggling them around the center locations, so they are not all drawn on top of each other. The histogram plot is a 2D representation of the joint probability distribution, where the histogram bins are computed using the optimal-bin size algorithm proposed by Shimazaki and Shinomoto. 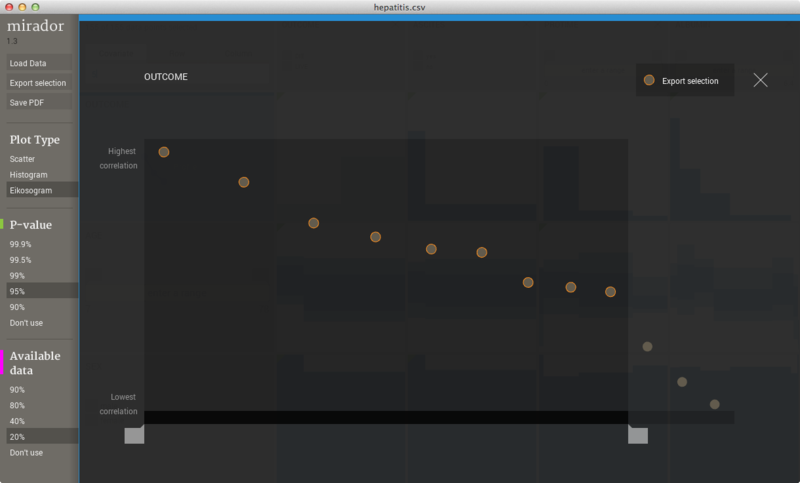 As mentioned previously, one can sort the columns according to their similarity score with a chosen row. Once the sorting is completed, a new view is available to help navigate, select, and export the results of the sorting. This view is a profile that represents each variable as a point where its height is proportional to the magnitude of the score. Only the variables that pass the test of statistical significance for their association with the row variable are used to construct the profile. 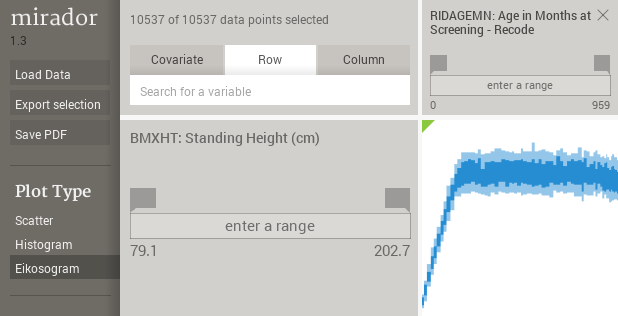 When the users clicks on a variable in the profile, Mirador will open the corresponding plot in the variable browser. 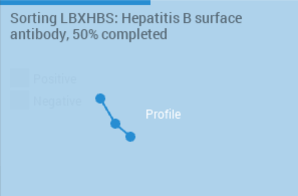 By dragging the handles in the bottom of the profile, one can define a range of selected variables. This range is used to save the corresponding data into a separate table file when pressing the export selection button. 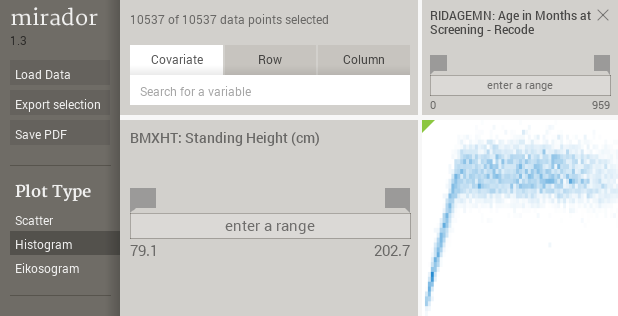 The exported profile data is saved as a stand-alone Mirador project, including not only the profile, but also the data for the selected variables and the current ranges. This data can be used for further statistical analysis outside of Mirador, as it is shown in this Machine Learning tutorial. Mirador is designed to be used entirely with the mouse, but it also accepts keyboard input to speed up certain operations. The previous sections shown that variable names can be typed in the search box to locate a variable more quickly, and also the SHIFT+mouse click combination allows to invert category selections. 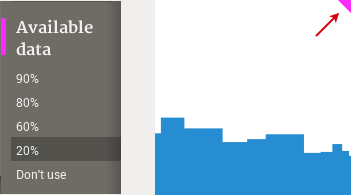 Cursor keys (LEFT, RIGHT, TOP, DOWN) to scroll through the variable browser. SHIFT can be used to invert a closing operation: if SHIFT is pressed when closing a row or column, then all the other rows/columns with the exception of the selected one will be closed. Pressing SHIFT while hovering the "Load Data" button will turn it into "Reload", which simply loads the current data into memory again, reseting any ranges and view changes. It is also possible to use the underlying functionality in Mirador (data loading, correlation calculation) from Python. Miralib is the underlying module in Mirador that handles the data loading and statistics analysis, which be accessed from Python, as it is described in this tutorial. 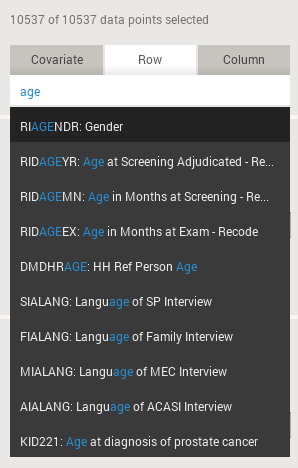 The documentation of the Miralib API is not yet complete, but can be accessed here.